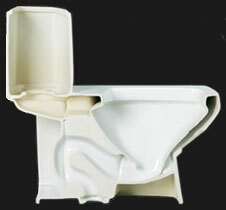 We are very excited to offer you this top of the line brand of eco-friendly low consumption modern smart toilets. 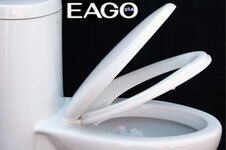 Join the latest fashion trend with EAGO's innovative line of green products. High Efficiency Low Flush Eco-Friendly 1.28 Gallon flush. One Piece Toilet. Enjoy a sleek solid European design. Not only does it look so much better than your old toilet it also works a whole lot better. 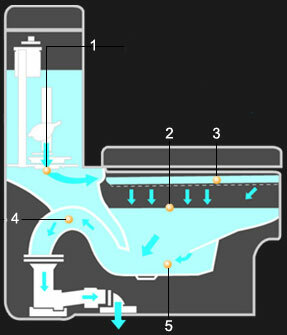 Siphonic Flush System. New tower based mechanism. There is no chain to snap and no flapper to partially close leaving your toilet running. Living the Green Life. This environmentally friendly toilet will save a family of four an average of 10000 gallons of water per year! Comes with the original EAGO logo of authenticity on the front of the tank. 1. Powerful and efficient 3" flushing valve. Reduces the number of problems typically associated with older ball-chain-flapper systems. 4. Large 2" fully glazed trap. Fully glazing the trap way ensures that waste flows smoothly to the exit with a single flush each time. 5. Big Jet Hole. This toilet also includes the wax ring for installation. 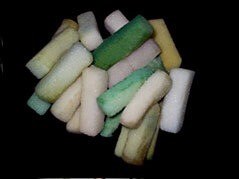 Tested Flushing Power: 25 sponge stripes. 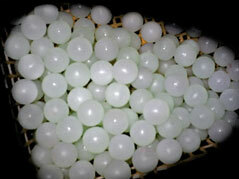 90 polypropylene balls. Fully Glazed inside & out. Powerful and efficient 3" flushing valve.